Observation - Female common lizard - UK and Ireland. Description: About 20-25cm long with brown body and black/dark brown stripes running down its entire length. 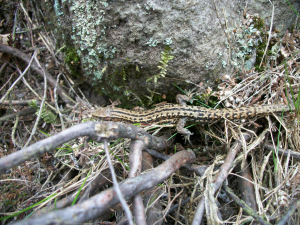 About 20-25cm long with brown body and black/dark brown stripes running down its entire length.